We have driven a cavalcade of some of the most sought-after SUVs on the planet and in all sizes, right from the baby Mahindra KUV100 NXT, to the upcoming 2018 BMW X3, the recently launched Skoda Kodiaq, the Mercedes-Benz GLE 400 and the massive Italian beauty that is the Maserati Levante. It was a mammoth task but we did it just for you... and maybe a little bit for us too! The country's biggest automobile extravaganza, 2018 Auto Expo has been announced and we present a detailed view on the who, what, where of this event. It will be held in February 2018, so you can read up about it in our opening piece of the Motoring News section to help you plan ahead. What, you think we only drove SUVs? Nope. 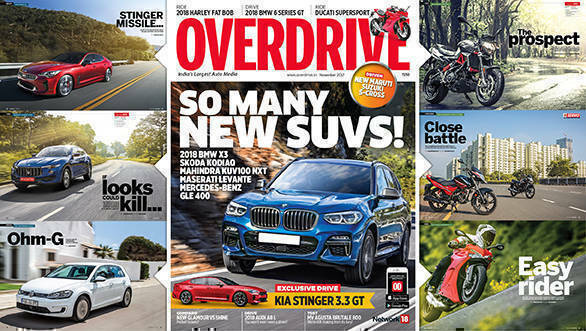 We take an exclusive drive of the Kia Stinger 3.3 GT, as well as the VW e-Golf, the BMW 6 Series GT, and the Audi A8L. The brand new Audi A5 Sportback, and S5 reached India and we take them out for a spin through Rajasthan. Also, find out what we think of the 2017 Maruti Suzuki S-Cross, an important update for the manufacturer in the face of growing competition. The November 2017 issue has one fun-filled dose of two wheels. We ride a trio of the newest India-bound 2018 Harley-Davidson Softail family motorcycles - the Fat Bob, Street Bob, and Heritage Classic through scenic Spain. From American heavyweights to Italian middle-weights, we find out if the new Ducati Supersport S manages to hit that balance of a sporty ride and practicality. We then test the MV Agusta Brutale 800 and the Aprilia Shiver 900. We compare two top contenders from the busy 125cc motorcycle segment - Hero Glamour and Honda CB Shine. The 19th edition of Maruti Suzuki Raid de Himalaya shows what happens when you trod the path less taken. There were two rounds of MotoGP held since our last issue and we bring you detailed coverage on them. The Asia Road Racing Championship comes to India for the last round and a lap record was set at the MMRT, Chennai. WRC driver Andreas Mikkelsen resurrects his career, while our correspondent Rishabh Bhaskar tells you about his learnings from the TVS one-make racing championship. Is that it? No, but you'll have to pick up the November 2017 issue to find what else is in store for you. Off you go, now!